Newborn images are perfect for creating unique editing effects. In addition to the pencil sketch effect, one of my favorite techniques is to make the image appear as though it was hand painted. 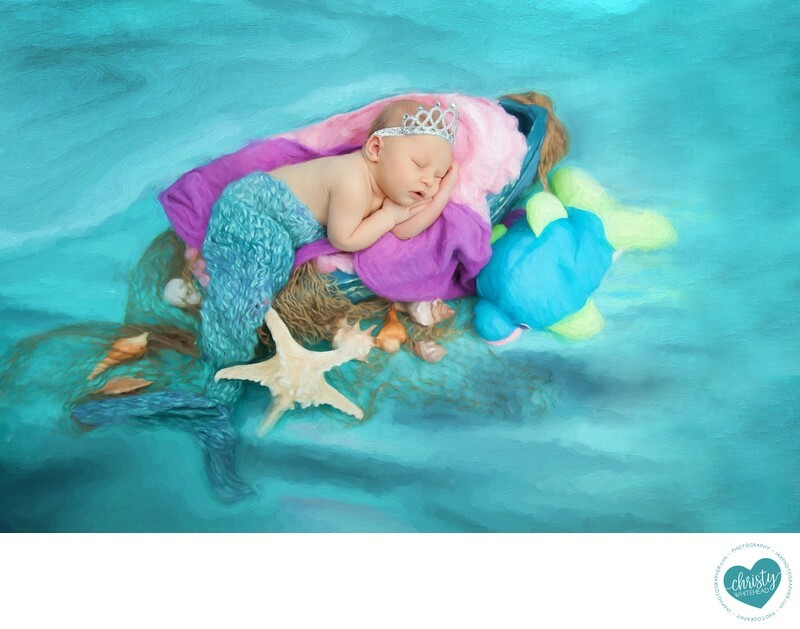 It looks especially amazing on the photo of this sweet, sleeping mermaid. We photographed her with her momma's dolphin from childhood and it was the perfect photo to apply this painterly effect. I love the way it gives it a dreamy, under water feel. This paint technique makes the image appear as though it was hand painted using watercolors. Like my sketched images, it's best to print these types of photos large. It's a versatile effect that looks amazing on metal prints, canvas, wood or traditional print. This is one of my favorite techniques to recommend for newborn portaits as the finished product ends up feeling dreamy and whimsical. It almost looks like as though she really is in the sea. If you love either of these techniques we can plan for it during your newborn session consultation. Or if you see an image you love during your reveal and want to have it applied, we can! This is just one of the many ways we can make your newborn photos custom to you. Contact me today to create your unique newborn photography experience.